Air-conditioning system is the major energy juggler in energy juggler when compared with other energy consuming components in the building. It contributes approximately 40 – 60% of overall energy consumed in facility. In present market, there are systems available, which are of less energy intensive when compared with active vapor compression (and vapor absorption systems, like conventional evaporative coolers, EAT (Earth Air Tunnel) etc. Limitations with respect to evaporative coolers (direct and indirect type) are that, fundamentally these are limited by the moisture content in the air. Alone, these coolers can achieve temperatures that approach the dew point of the ambient air without adding humidity; however, they cannot dehumidify. Thereby, it is suitable for arid and semi-arid climates. 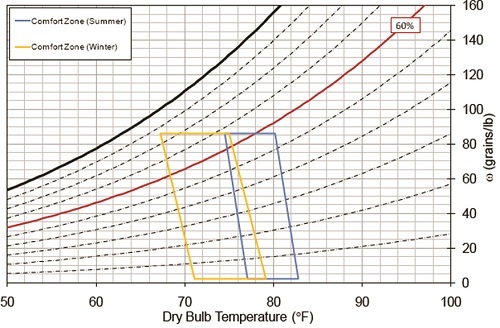 Whereas, EAT is complex in execution, could not control the humidity and it requires additional active cooling systems to achieve the thermal comfort year round (Refer Figure 1). 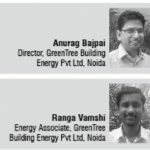 DEVap system, developed by NREL (National Renewable Energy Laboratory) is designed to address the inefficiencies mentioned above in present day less energy intensive air- conditioning systems. This article informs about DEVap, its working principle and evaluation and limitations and advantages. DEVap is a concept of desiccant enhanced evaporative air conditioner (DEVap) with the objective of combining the benefits of liquid desiccant and evaporative cooling technologies into an innovative ‘cooling core.’ Liquid desiccant technologies have extraordinary dehumidification potential, but require an efficient cooling sink. Direct combining of desiccant driven dehumidification and indirect evaporative cooling technologies is customary, but it leads to too large and complex system. DEVap attempts to clear this hurdle and combine, in a single cooling core, evaporative and desiccant cooling. DEVap’s crucial advantage is the intimate thermal contact between the dehumidification and the cooling heat sink, which makes dehumidification many times more potent. This design uses membrane technology to contain liquid desiccant and water. When used to contain liquid desiccant, it eliminates desiccant entrainment into the airstream. When used to contain water, it eliminates wet surfaces, prevents bacterial growth and mineral buildup, and avoids cooling core degradation. 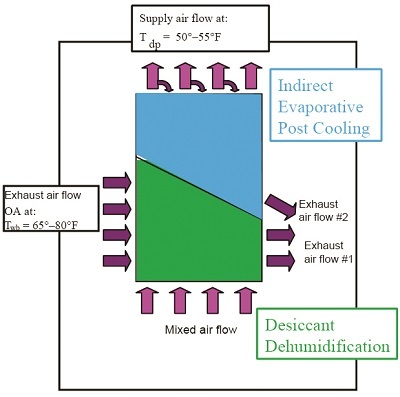 DEVap’s thermodynamic potential overcomes many shortcomings of standard refrigeration- based direct expansion cooling. DEVap decouples cooling and dehumidification performance, which results in independent temperature and humidity control. The energy input is largely switched away from electricity to low-grade thermal energy that can be sourced from fuels such as natural gas, waste heat, solar, or biofuels. Thermal energy consumption correlates directly to the humidity level in the operating environment. DEVap concept is an enhancement of LDAC (Liquid Desiccant Air Conditioner). 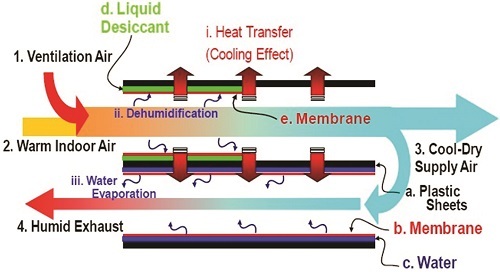 LDAC technology uses novel heat and mass exchangers (HMXs) to perform dehumidification with desiccant and desiccant reactivation using desiccant conditioner and scavenging air regenerator (Refer Figure 2). The liquid desiccant is absorbed into the conditioner (absorber) where the inlet ambient air is dehumidified. The liquid desiccant is regenerated in the regenerator (desorber) where the water vapor desorbs into the EA stream. This technology is called low flow liquid desiccant A/C, because the desiccant flow is minimized in both HMXs to the flow rate needed to absorb the necessary moisture from the air stream. The HMXs must, therefore, have integral heating and cooling sources (55°–85°F cooling tower water is supplied to the conditioner). The regenerator uses hot water or hot steam at 160°–212°F. The cooling or heating water flows internal to the heat exchange plates shown. The desiccant flows on the external side of the HMX plates. The plates are flocked, which effectively spreads the desiccant. This creates direct contact surfaces between the air and desiccant flows. The air passes between the plates, which are spaced 0.25” apart. 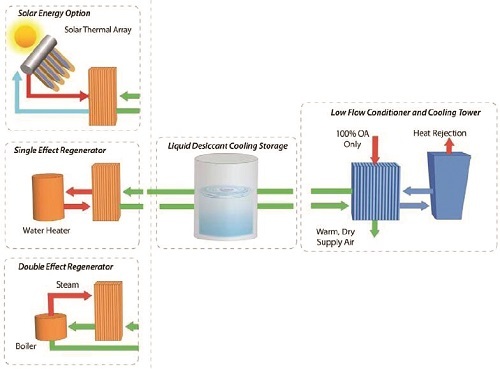 Figure 3 provided below, illustrates the three basic ways to regenerate the desiccant system with a thermal source: solar, water heater, and a double effect. The water heater or boiler can be fueled by many sources, including natural gas, combined heat and power (CHP), or even biofuels. Ventilation air  and warm indoor air  are mixed into a single air stream. 2. This mixed air stream (now the product air) is drawn through the top channel in the heat exchange pair. 3. The product air stream is brought into intimate contact with the drying potential of the liquid desiccant [d] through a vapor-permeable membrane [e]. 4. Dehumidification [ii] occurs as the desiccant absorbs water vapor from the product air. 5. The product air stream is cooled and dehumidified, then supplied to the building space . 6. A portion of the product air, which has had its dew point reduced (dehumidified), is drawn through the bottom channel of the heat exchange pair and acts as the secondary air stream. 7. The secondary air stream is brought into intimate contact with the water layer [c] through a vapor-permeable membrane [b]. 8. The two air streams are structurally separated by thin plastic sheets [a] through which thermal energy flows, including the heat of absorption [i]. 9. Water evaporates through the membranes and is transferred to the air stream [iii]. 10. The secondary air stream is exhausted  to the outside as hot humid air. Complete water containment:It completely solves problems with sumps and water droplets entrained into the air stream. • Dry surfaces:The surface of the membrane becomes a “dry to the touch” surface that is made completely of plastic and resists biological growth. The water-side membrane may not be necessary in the DEVap configuration as wicked surfaces create successful evaporative coolers. Omitting this membrane would result in cost savings. Complete desiccant containment:Breakthrough pressure (at which desiccant can be pushed through the micro-size pores) should be about 20 psi or greater. • Water vapor permeability:The membrane should be thin (~25 μm) and have a pore size of about 0.1 μm. Its open area should exceed 70% to promote vapor transport. The DEVap cooling core (Refer Figure 5) is an idealized implementation of the air flows. A higher performing air flow configuration (Refer Figure 6) shows the cooling device split into two distinct areas and depicts the air flow channels from the top vantage point. The mixed ventilation air and return air enter from the bottom and exit at the top. The location of the desiccant drying section is shown in green; the location of the evaporative post cooling is shown in blue. Using OA to cool the dehumidification section improves the design by enabling higher air flow rates to provide more cooling. Thus, the left half of the exhaust channel (Refer Figure 5) is replaced by an OA stream that flows into the page (Exhaust Airflow #1). The deep cooling of the indirect evaporative cooler section requires a dry cooling sink; thus, some dry supply air is siphoned off (5%–30% under maximum cooling load) to provide this exhaust air stream (Exhaust Airflow #2). This section is placed in a counterflow arrangement to maximize the use of this air stream. This is essential because it has been dried with desiccant, and thus, has a higher embodied energy than unconditioned air. The result is that the temperature of supply air is limited by its dew point and will come out between 55°–75°F depending on how much is siphoned off. Combined with the desiccant’s variable drying ability, the DEVap A/C system controls sensible and latent cooling independently and thus has a variable SHR between <0 (latent cooling with some heating done) and 1.0. The DEVap core is only half of a complete air conditioner. 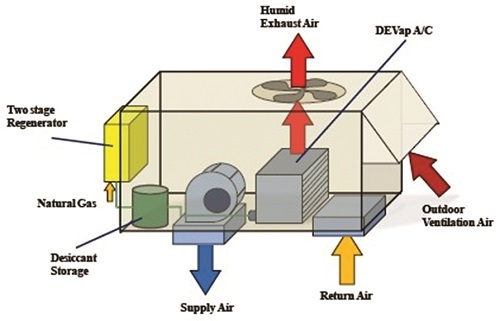 Figure 6 depicts how the DEVap cooling core enhances the already developed LDAC technology and converts it from a dedicated outdoor air system to an air conditioner that performs space temperature and humidity control and provides all the necessary ventilation air. In fact, DEVap can be configured to provide 30%– 100% ventilation air. Furthermore, DEVap does not require a cooling tower, which reduces its maintenance requirements. Because the drying process creates sufficiently dry air, the evaporative process is no longer a function of climate. Therefore, DEVap will work in all climates. DEVap is novel and disruptive, so bringing it into the entrenched conventional air conditioner market will create some market risk. Designing and installing a new DEVap system requires retraining. DEVap has unknown longevity and reliability compared to standard A/C. The availability of natural gas or other thermal energy sources may be an issue in certain places. 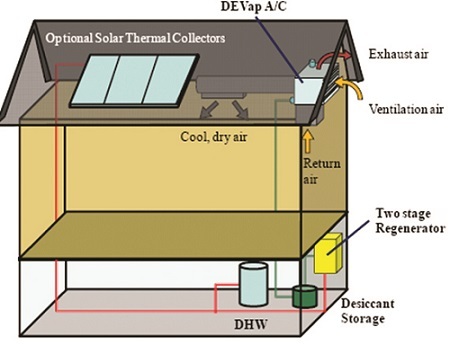 However, DEVap does not require a large outdoor condenser, but instead uses a much smaller desiccant regenerator that can be placed inside or outside, and can be integrated with solar and waste heat. 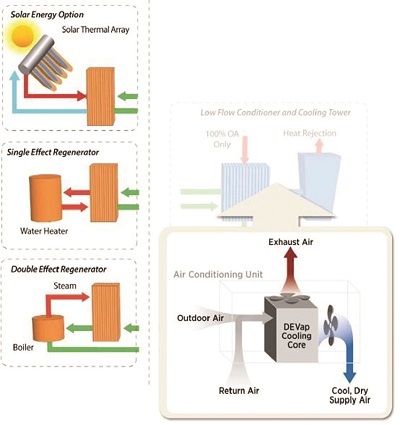 If these risks can be properly addressed, the DEVap air conditioner concept has strong potential to significantly reduce energy consumption and provide value to energy companies by reducing summer time electric power demand and resulting grid strain. Also, unlike most heating, ventilation, and air- conditioning systems, DEVap uses no environmentally harmful fluids, hydrofluorocarbons, or chlorofluorocarbons; instead, it uses water and concentrated salt water.